Kerala, appropriately known as God’s own country, is a place known for its mesmerizing landscapes and breathtaking beauty all year around. It is also land to numerous Gods and Goddesses, and a thriving ground for age-old myths and traditions. Guruvayur stands out as one of the most prominent culturally rich centres, and the holiest place in the state of Kerala. It is this divine place that attracts thousands of tourists from all parts of the world, who come to pay homage to Lord Mahavishnu, the omnipotent and all pervasive god of the Hindus. The idol of Mahavishnu is located in the famous Guruvayur temple, which is the main attraction of the place. This 1000 year old temple consecrates Lord Vishnu in the form of Sri Krishna, adoringly called Sri Guruvayoorappan. Visiting the deity is considered a most auspicious event by Hindus, and many devotees go there once or twice a month, and stay around for a few days to weeks. The divine aura of Guruvayoor is perceptible in every nook and corner of this enchanting town. Staying in the centre of the Guruvayur town at walkable distance to the temple has its many advantages. One gets to feel the aura, and the smells and sounds that emanate from the temple. Walking to the temple twice a day to offer prayers is a dream come true for most Hindus visiting Guruvayur. Bhasuri Inn provides the exclusive atmosphere for devotees to stay in clean and comfortable environs and take in the devotional charm of the place. Located very near to East nada, one can reach the temple in less than 10 minutes. The rooms here offer a splendid view of the holy place, and the lush greenery around. We also offer variety cuisine which includes authentic Kerala-style food, prepared in a most hygienic manner. Apart from the temple, there are also other places of interest in the town of Guruvayur. Anakotta – An elephant sanctuary run by the temple authorities, this 10 acre sprawling plot cares for 60 – 90 elephants of all sizes. It is also a training centre for both elephants and mahouts. Mammiyoor Temple – Located very near to the Guruvayur Temple, the presiding deities here are Lord Shiva and Goddess Parvathy. 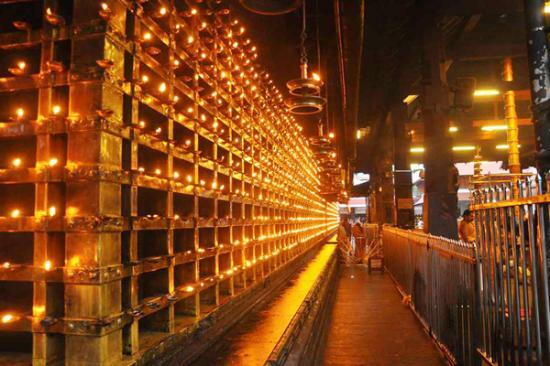 A visit to the Guruvayur temple is considered incomplete without visiting the Mammiyoor temple too. Thiruvenkidom temple – Just one km away from the Guruvayur Temple, the deity here is Balaji (Lord Thiruvenkitachalapathy) who is also worshipped in the same form in the famous Thirumala Temple in Andrapradesh. Guruvayur is thus a place of great wedding at guruvayoor temple ,cultural significance, ensuring a rewarding spiritual experience for anyone seeking to explore this God’s own land.